This was my second beer hike in three days. Eighteen hours after a fun and exhausting hike in Port Angeles, I met some fellows at the Extreme Beer Pairing and Mustache Contest. 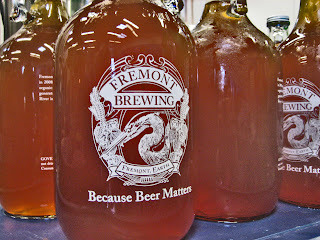 They told me about both Fremont Brewing's Harvest Ale and Naked City's wet hopped Ace In the Hole. And thus, another urban beer hike was born. Anyway, I was also reminded, via Twitter, that The Buckaroo Tavern was slated to close the next night. So, even though I knew exactly what the scene would be like on its last night ever, I chose to add it to the route. 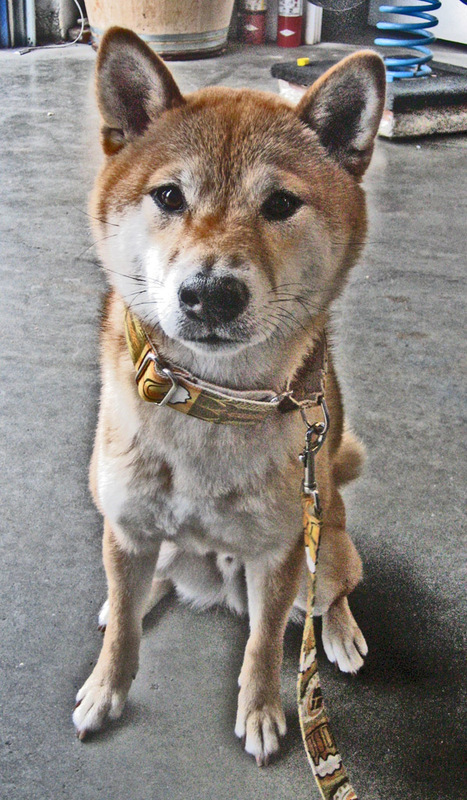 Link and I donned our rain gear and began at Fremont Brewing. The Harvest Ale was every bit as tasty as I expected it to be. FBC's track record over the past year or so has been unbelievably good. Link was happy because he got bunches of treats and I was happy because two more hikers joined up to make the trip up to The Buck. 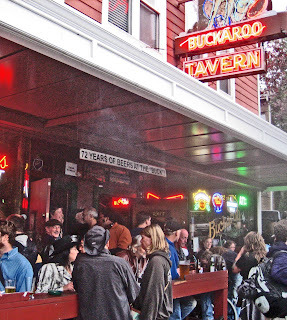 After a pretty scenic walk up through Fremont and over Aurora Ave. N., we arrived at The Buckaroo Tavern to find it packed to the gills, as expected. 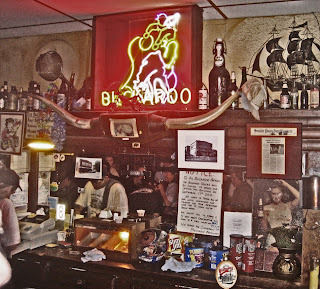 Even though I hate crowds, I wouldn't let that deter me from having one last Buckaroo beer. I politely -- but firmly -- made my way through the dense crowd of people up to the bar. While I waited my turn, I looked around and noticed how happy everyone seemed to be. Spirits were high now, but I caught myself wondering what it would be like at the final last call in a few hours. I can't say that I ever went to the Buck often enough to be considered any kind of regular, but when I heard that it was closing (and possibly moving), I was saddened. 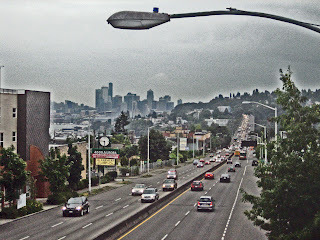 It's another in a long line of good-time, down-home, working-class Seattle taverns that have met their end over the past few years. 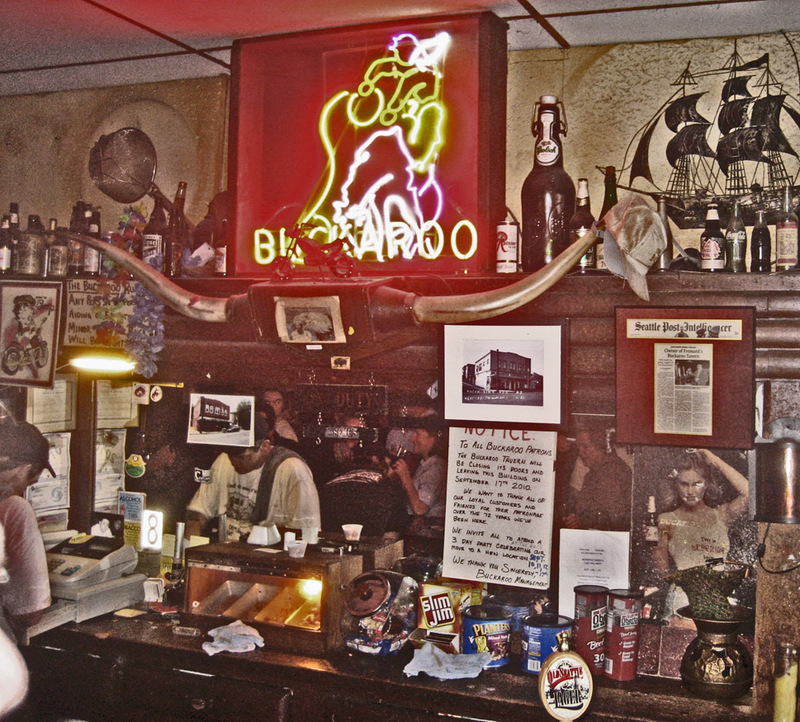 The Buck always felt like one of those places you could count on. Things hadn't changed much in their 70+ years on the block and you knew what to expect when you went there. And you usually got it. Pretention wasn't tolerated, the beer was good, and the conversation was friendly (usually). Only half of us made it inside the joint at first since it was so packed, but I managed to get a pitcher of Old Seattle Lager and walk around with it, pouring beer into any stranger's glass who wanted it (yeah, probably illegal). Link waited patiently for me outside with the other half of the hikers and then we switched up so everyone could check it out one final time before saying goodbye. As we left the Buckaroo, the rain finally came. My new minion Mike and I decided to press on while the rest of the group went their separate ways. It was time to get some food and I was craving a Red Mill burger. Red Mill didn't have too much of a line when we got there, but that quickly changed right after we ordered our burgers. It took the usual amount of time for our food to come (always worth the wait, by the way) and I was half way through my burger before I realized that it wasn't what I ordered. Even a plain Red Mill hamburger is outstanding so I hardly cared. Mike and I happily sat under the awning, eating our burgers and drinking two of the cans of Caldera IPA I was carrying in my backpack. (Red Mill does not serve beer.) Link and some other dude's dog were shamelessly begging, but they got nothing except a few dog cookies. It's a straight shot north from Red Mill to Naked City and we made it in very little time. Mike, Link and I arrived wet, but happy. (Sadly, Link had to remain outside on the sidewalk. It's sheltered, but dank and he probably would have preferred to join us inside where all the fun was.) As usual, the beer list at NCBC was dizzying -- I saw only about three or four things that I DIDN'T want. I got what I came for -- the wet-hopped Ace in the Hole and then basically slammed a Southern Tier Pumpking because I felt bad leaving ol' Link out on the sidewalk. 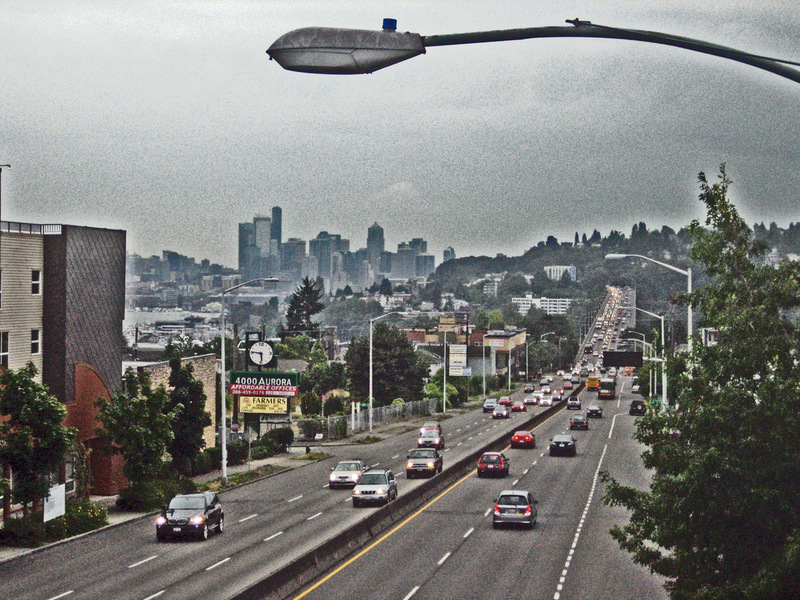 It was another dark and rainy mile or so home from Naked City. It was coming down pretty good by now and neither Link nor I could wait to get home and dry off. 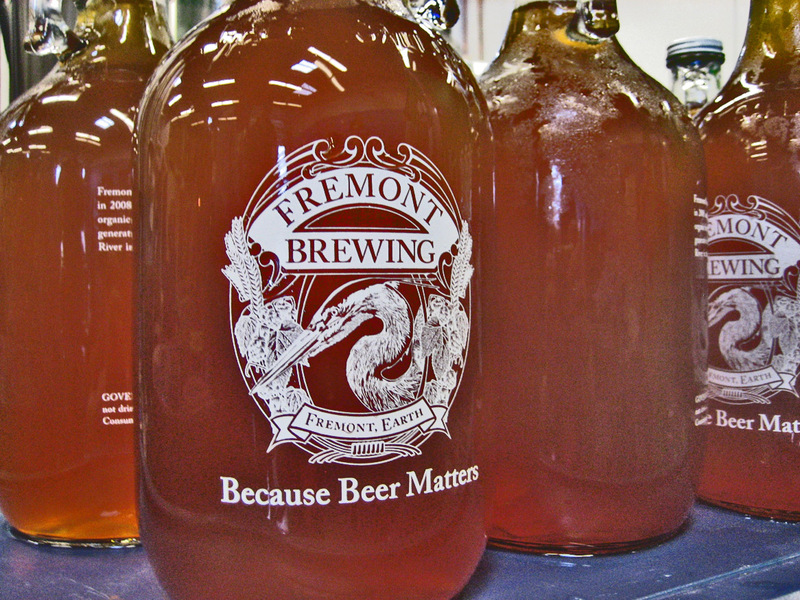 The harvest and pumpkin beers means that fall has definitely arrived, and soon it will be winter. There are definitely more wet hikes to come.